These days, every business is looking for a way to minimize costs and maximize outposts, and you may be surprised to find that an investment in a commercial dry vapor steam cleaner for your business can do just that. Admittedly, when most managers look at ways to grow their business, they look at new product lines, new production methods, automating systems, and streamlining procedures. Cleaning the office or warehouse is merely a byproduct of doing business as far as most people are concerned. It is one of the necessities of being in business like paying inventory taxes or hiring a lawyer to protect your firm. Cleaning, for most businesses, is a part of doing businesses, but it is a minute detail, a byproduct. Cleaning rarely takes front in center in a business unless that business is a cleaning company. However, the facts show that companies that take cleaning serious and invest a little bit of time and money into it can enhance their productivity and efficiency, thus increasing their profit margins. But, how does this work? Well, the first thing to keep in mind is that for cleaning to enhance your business, it has to be done right. This is why a commercial dry vapor steam cleaner is a step in the right direction. The reasoning behind this is multi-fold. First, a dry vapor steam cleaner relies on the most powerful and safe natural solvent in the world—water. This means that companies using an industrial dry vapor steam cleaner are at an advantage as they are using water to clean. It is highly effective and it does not require an investment in various cleaning chemicals and materials that may or may not work. Those same cleaning chemicals that most companies have used for years have been known to cause issues with people’s allergies, staining fabric, speeding up oxidization on metals, and so on. And, that is something that people are paying for. 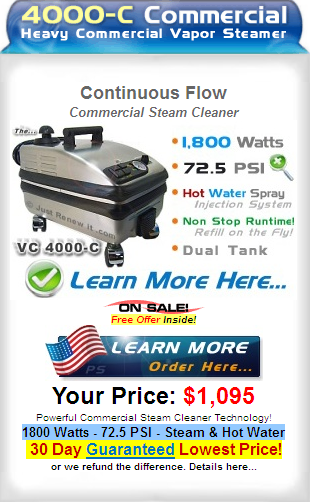 A commercial dry vapor steam cleaner works by pressurizing and heating water. The steam ejected from the nozzle is typically 95% or better dry. That means very little actual water is being left to run down walls, behind machines, or otherwise to be cleaned up later. The pressurization, heat, and steam work together in a unified effort to scrub, disinfect, and breakdown chemical bounds of dirt and other residue. Another consideration for many looking at commercial vapor cleaners is whether there are chemicals in the mix. Some commercial steam cleaners have reservoirs to mix in cleaning agents and the units can be used with or without these chemicals. The cleaning detergents are important, especially if you are working in a public business where people may be more sensitive or have allergies that are irritated by the chemical agents. This is one reason using vapor cleaners in commercial businesses has become preferable. The cleaning can be done without chemicals and minimal mess. There isn’t a bunch of water left behind so that areas must be left alone for hours to dry. These are not the sorts of traits you can expect from a residential steam cleaner. This is why it is so important to be sure that you are getting a unit that is more durable and more powerful when it comes to commercial steam vapor cleaners. There are a lot of steam cleaners on the market these days, but the residential and commercial models have a number of differences. One of the key items is that residential units are not made from the same, durable materials that commercial dry vapor steam cleaners are. 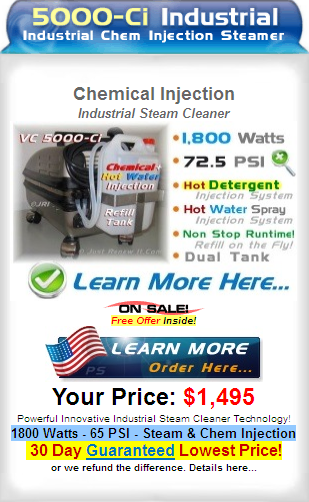 Those less expensive, residential steam cleaners are made primarily of plastic. Plastic simply is not as strong as the metal components used in quality commercial dry vapor steam cleaners. It breaks and cracks easily. It does not have the strength necessary for the temperatures and pressure that grant the commercial dry vapor steam cleaners their effectiveness. So, if you have a unit that is made cheaper, it simply is not going to work as well. It is not going to produce the same high temperatures that will kill germs and disinfect surfaces. Without the high pressure, you are going to end up doing a lot of scrubbing that could have otherwise been done by a higher quality machine. And, what kind of trouble are you looking at when you need to have parts replaced on your steam cleaner? Do you have to ship it somewhere and have it shipped back? Is there a local facility you need to take the steam cleaner to and the pickup from once it has been repaired? And, how long do those repairs take? Are you paying for parts and labor or just parts or just labor? With plastic steam cleaner components, you very possibly will be responsible for both charges, because the warranty on these models isn’t as good as high quality commercial steam cleaners. 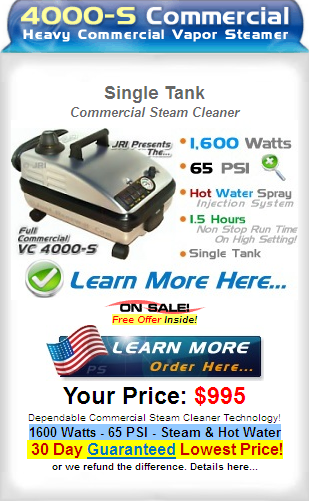 Overall, the commercial dry vapor steam cleaners work better in a business setting. The reason for this is that they do the job better and faster. By reducing the amount of germs and bacteria on surfaces throughout the business, you are promoting a healthier work environment. You end up having people get sick less often. If they are sick less often, then they are working more. Furthermore, even if they don’t call in sick, people who are sick but still go to work will not be operating at maximum efficiency. By making it less likely for them to get sick, you are making it more likely for your employees to be at work more often and operating at maximum efficiency. You can also see how the commercial dry vapor steam cleaner gets tough jobs done better and faster than traditional cleaning methods. You are not going to have to worry about the excessive cost of various cleaners, cleaners that may end up causing employees, customers, or vendors to have an allergic reaction, so you have to temporarily close down parts of the business. The units are safe and environmentally friendly, using around a gallon of water per an hour. When all the math has been calculated, commercial dry vapor steam cleaners allow you to run a business better, faster, and cheaper.